PHARR — Unanswered questions and concerns over a bold proposal to adopt a charter-like status at the Pharr-San Juan-Alamo school district have teachers doubting the move and union representatives urging a vote against it. “It is still a very, very dangerous bill and it is exactly what the reformers — the education reformers — … wanted and it is to privatize public schools, ” said Patty Quinzi, legislative counsel for the Texas American Federation of Teachers. Still, there were several claims presented at a recent meeting that were later proven to be inaccurate. Quinzi led a presentation at a forum organized by the PSJA school district AFT steering committee. Concerns and confusion over the plan seemed to be widespread among the 150 to 200 community members and district employees who attended the meeting to hear more on Superintendent Daniel King’s proposal to adopt Senate Bill 1882. The bill was intended to give districts with low-performing campuses the option to partner with public charters or other education-focused entities to run these schools as a last hope attempt to turn them around. The state would then provide additional time free of sanctions to improve campus attainment and, in some cases, the funds to match that of a charter school. This type of partnership can also be adopted as an “Innovation Partnership,” in which the campus doesn’t have to be underperforming. This is where PSJA school district campuses would fall into, according to King’s plan. The proposition involves adopting the bill district-wide, citing it as an opportunity to get additional funding — up to $28 million with district-wide implementation, he said — and to allow teachers a greater say-so in campus operations and initiatives. King first presented the full proposition to teachers a few weeks ago when he began a tour of schools to visit with teachers in person. But with only a skeleton of the plan worked out, teachers’ concerns have since ranged from their ability to actually be empowered in a campus if they are yet to know who will lead the education-focused nonprofits, to whether this could lead to a complete charter transitiion over the years. “A lot of what he is saying in terms of empowerment of teachers and additional salaries and raises is not exactly possible under this bill and under the commissioner’s law,” Quinzi said. The Texas Education Agency’s rules for the implementation of the bill state the partnering organizations would be given control over operations including hiring and curriculum. King’s plan, however, proposes creating contracts in which education-focused nonprofits will be held accountable via a contract for empowering teachers to innovate and involving them in the decision-making process. And while he admits this differs with TEA’s rules, King said he is committed to moving forward with the implementation so long as the commissioner approves it as is. The bill only requires him to consult with district stakeholders, something that teachers also appeared doubtful over. But when asked again about this concern, King said he is asking teachers to first vote on the matter and to only move forward with the implementation in the campuses where a majority of teachers vote in favor. Their concerns have been echoed by not only AFT but by the Texas Classroom Teachers. Which in a letter sent to PSJA members last week, officials stated they heard the same plan from King. But at the end of the day, if the commissioner requests amendments to the plan the decision would rest with the board of trustees. Among the recurring fears, additional claims against the district were made during the May 22 AFT meeting that required clarification. Quinzi stated that over the years, the district spent more than $500,000 in payments to lobbyists tied to the privatization of public school districts. While most public entities are prohibited from using state funds for lobbying, this doesn’t apply to local funds, a point Quinzi admitted to failing to clarify during the meeting. It also gives the firm permission to use Premier Legislative Consulting as a subcontracting firm. The two-year contract for $6,500 per month took effect on Nov. 1, 2016, and allowed for up to two additional renewals of two-year terms. Services requested included lobbying on behalf of PSJA’s interest in the matters of budgeting. King said the hire was made ahead of a legislative session in which they feared more budget cuts. This monthly payment amounts to $78,000 per year, as per the contract. But the Texas Ethics Commission only discloses client payments or prospect payments in ranges. Meaning the PSJA school district’s prospect annual payment to Andrade-Van de Putte falls under the $50,000 to $99,999.99 range. Quinzi did mention that the agency did not see the contract before the presentation. But she failed to clarify was that in the two years that she mentioned, PSJA’s payment would have fallen anywhere between $100,000 and $200,000 for this contract, presenting only the highest possible number to attendees. The same was done with payments to a subcontractor used by Andrade-Van De Putte, the firm Premier Legislative Consulting, with David John Hubbard and Ian Michael Randolph. Alexis Fonseca, compliance director and office manager at Andrade-Van De Putte, explained lobbyists must report as individuals and not under the firm. Hubbard and Randolph each get $1,625 per month from the monthly $6,500 paid to Andrade-Van De Putte, she said, amounting to $19,500 each per year. Under the ethics commission, this falls under the bracket of $10,000 to $25,000 as reported from 2016 to 2018. In her presentation, Quinzi outlined that the PSJA school district had paid Leticia Van de Putte up to $200,000 in 2017-18 and over $500,000 between 2013 and 2016 to a lobbyist representing Educate Texas. But the $500,000 figure was obtained by adding each maximum amount reported per lobbyist, which is inaccurate considering that the money came from the same $78,000. Between Nov. 1, 2016 and Nov. 1, 2018, the district is expected to pay a total of about $162,500, as per the contract. There were no payments by the PSJA school district to any lobbyist between 2013 and 2015 as per the commission’s website. When asked why these numbers were not accurately presented, Quinzi stated it wasn’t her intention to mislead anybody and admitted to omitting information, and also misunderstand how these numbers are reported. Other than the lobbying, there were also conversations about public school-charter partnerships, she said, dating back to 2015, which was long before SB 1882 was passed and prior to King looking into its implementation, which he stated was in November 2017. Quinzi presented an example of an email sent in January 2015 by John Fitzpatrick, executive director of Educate Texas, and addressed to El Paso school district Superintendent Juan Cabrera and former Dallas school district superintendent Mike Miles, in which a handful of other people, among them King, where copied. King admitted to being a part of the District Charter Alliance along with the school districts of El Paso, Grand Prairie and San Antonio. He stated he was approached by the group in 2015 as an opportunity to come together to find common ground ahead of the legislative session and the usual funding fight. 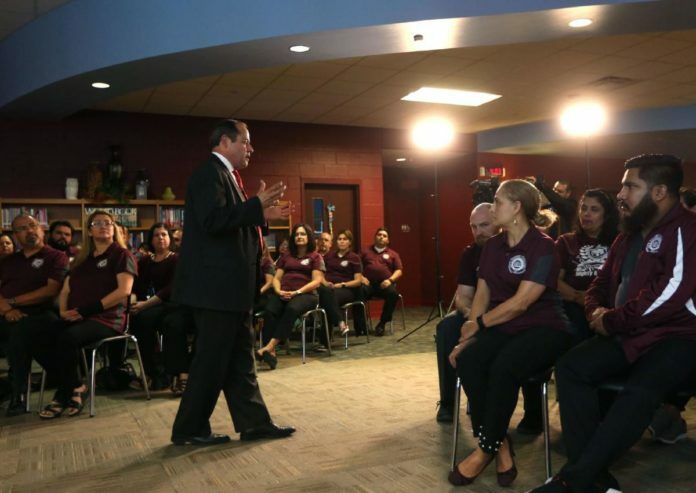 But it was too early for him to start thinking of a move of this kind, he said, as even when the bill was introduced it was intended solely to help only struggling schools, and that wouldn’t have applied to PSJA. It wasn’t until he read an article and realized that there was room for implementation focused on innovation that he became interested, he said. He then worked on the pitch and met with Texas Commissioner of Education Mike Morath, he added, who gave him the figure of $906 per student in additional funding per year and provided positive feedback on the plan. If the state didn’t provide the funds, or if these were to be taken back from the district after implementation, King said the district wouldn’t implement it or would end the partnerships, as this would mean spending their own funds to pay the nonprofits. Each campus is being asked to vote this week as the next part of the application would be to take it before the board and submit all materials by July 2 and receive an answer by July 23. And while King said he understands this is rushed, he said it was hard to pass up the opportunity to possibly get additional funding for the upcoming school year, especially not knowing how long the law will be in place.